Are you an early bird who loves photographing epic, natural beauty? Or perhaps you are wondering what to do at 5 am as you will be jet-lagged and waking up on mainland time. Are you looking to experience the richness of Hawaii’s Oahu Island? We invite you to our Golden Sunrise Photo Tour! Be guided to some of the biggest hot spots of Oahu Island to capture stunning photographs and be home in time for lunch. This 5.5-hour tour kicks off under the brilliance of the rising sun and takes you on a journey to witness oceanic views and the stellar topography. Experience Sandy Beach, Makapu’u Lookout, Waimanalo Bay, and viewing the Ko’olau Mountains from two locations, we highlight how every angle, frame, and perspective of a subject is unique and tells a different story. We give you plenty of time to explore the landscape and capture photographs. Our Golden Sunrise Tour is the perfect way to start your vacation. Don't sleep your holiday away. 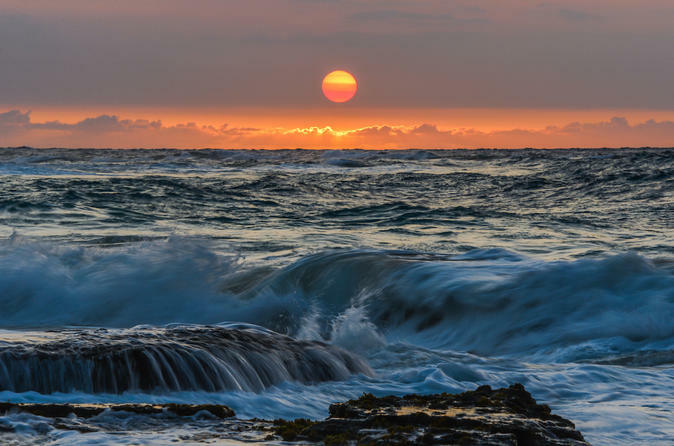 Oahu Photography Tours offer a “Golden Sunrise” photo tour for those who are looking for a shorter time commitment but whom also wish to experience significant scenic locations on Oahu Island. We’ve put together an itinerary that guides you through gorgeous and dynamic scenes while also creating space for your freedom to explore to capture photographs that you’ll cherish on this sunrise tour. We start the day on a high note, beginning our guided sunrise photo tour at the infamous Sandy Beach to capture the sun breaking over the horizon. Witness how the sun lights up the sky and the Pacific Ocean with pure brilliance, giving you the opportunity to capture interesting photos of its splendor. After sunrise, we move on to the beautiful Makapu'u Lookout. These locations are mindfully chosen for the views of East Oahu’s stunning landscape. With an abundance of beautiful sights to soak in, we encourage our guests to capture panoramic photos of the area to capture the perfect picture of Hawaii’s natural landscape. Continuing to Waimanalo Bay Beach Park, ranked as the #1 beach in America, you’ll visit the longest uninterrupted white-sand beach on Oahu. This famous Hawaiian destination is something you must do when visiting Oahu. Imagine it now: A beach lined with old growth and unique Australian ironwood trees, blending the elements of air, earth, and water. Your photographs will reflect the good health of this natural environment! Not to mention how amazing they will look printed out on your wall for everyone to enjoy. Our next stop up the Windward Coast of Oahu is a view of the majestic Ko’olau Mountains. Behold the sight of ancient rock formations that were formed over 1 million years ago by the formidable forces of exploding volcanoes and massive earthquakes. It will surely take your breath away. Next, we head off to a local treasure. The Kalapawai Market is the best stop for a delicious and truly satisfying breakfast. This market has been a part of Hawaiian life since 1932. The market offers an array of food and drinks options to please every pallet. Our next stop on the Golden Sunrise Photo Tour lands us at the beautiful Ko’olau Mountains at the infamous and historical Pali Lookout. This site was chosen by Ansel Adams himself after he beheld the majestic qualities of these cliffs. We will end the morning enjoying a grand view of the Waikiki skyline on the tip of the famous Tantalus Lookout. Recognizing the enormous potential this location has for capturing beautiful photographs, we knew it qualified as a big send off of any memorable Oahu photo tour. Trust us, once you get there, you’ll understand!